3D Easter Truck Box with Egg to use as Easter Basket. 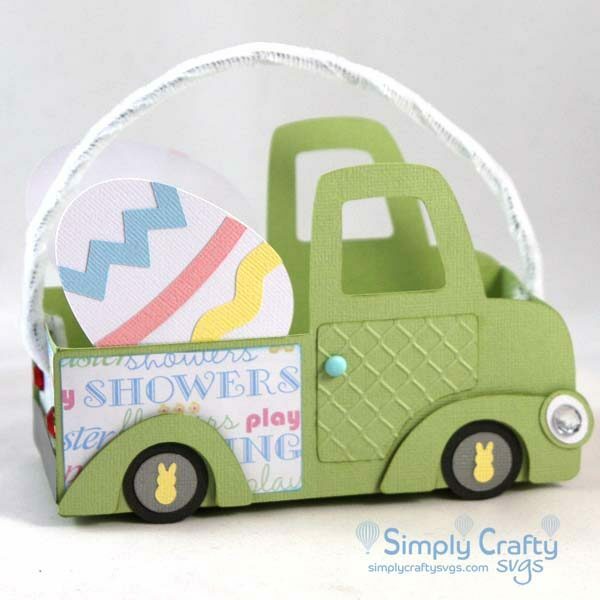 Make an truck Easter basket using the 3D Easter Truck Box SVG File. Egg svg files are included to add to the back of the truck, but you could easily change that out with any other SVG design. Finished truck size without handle is 6.4” x 2.5” x 4” high. 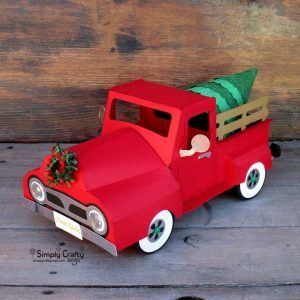 See optional svg files without holes to make a truck for any occasion. Box without panels requires (2) 12″ x 12″ cardstock sheets to cut out. However SVG files are letter-size compatible sizes, if ungrouped. Smaller paper can be used for small patterned panels shown and smaller elements. If you have been looking for a simpler 3D truck SVG file, this is it. White pipe cleaner (for handle). Recommend wired twine too.